Simon E. wrote: ↑ That context will be as part of a raft of other practices that balance each other and will ALWAYS be in the context of a personal relationship with a teacher. Or they are not really Vajrayana. Simon do you accept that "really Vajrayana" and "not realy Vajrayana are temporary? Soon there will be no Vajrayana, no Buddism, no Buddhist books, no people, no earth, no solor system, no human history, no history of religion and so on. When the sun explodes. That will happen. And before that a super volcano or asteroid may accomplish much of the same. So why is it still a good idea to practice, specifically, the real Vajrayana? As usual tomschwartz I have absolutely no idea what you are getting at. This is no doubt my problem. So I will have to leave it to others to answer you. Re: Accept everything or change something? May I ask, impartial respect-acceptance and strong individuality, how this goes together? Getting rid of self comes later. So the plan for our children should be: self is safe, self discovery, others are important too, self expression, then buddism (accept respect love gone). So the answer to you question, if there were "12 links of dependent enlightenment " for humans, they would sit like a rainbow with strong individuality being the ground work for the opposite: buddhism. The former helps us feel that we are no longer (even potentially) hungry for doing anything. Thank you, I have read it. I think it is easy to mix by talking on a forum, the two wings of the Bodhichitta bird. This is a big mistake and I am one who is guilty of that. Because for example Rushan in order to see the difference between dream and sleep for oneself, is own business. Purify own perception and have place in the very heart for all ( so to speak). But even this has no value to say. It is a sign of not having skills to inspire and the idea it inspires, is an idea. At least there is the need to first help oneself. Tsoknyi Rinpoche his words about essence love, I will try to find some of it on the internet. He talked once about emotional suffering. Then respect-love are blocked. It is necessary to see/ know such in order to offer helpful dharma. for example: "If I don’t understand the culture—whether we’re talking about European culture, or Japanese culture, or Chinese culture, or modern culture broadly—it’s very hard to bring Dharma into people’s lives." Should I accept everything as is (meditate, see dependent origination of all things, all things are empty of inherent existence, wisdom of discernment, wisdom of sameness, etc...)? Should I change something (tackle conflicted mental states, learn to love others with tonglen practice, quiet my mind, practice ethics, get off of the path of the hatred and anger and adopt the 8 fold path instead)? Or do both? If yes, how does that work for you? E.g. accept anger, let is dissipate naturally, then it no longer returns? Or repeat that process ad infinitum? How about accepting everything received from others as manifestations of their suffering/wish to be free, but changing your own mind and behaviour so that this acceptance doesn't cause you yourself to suffer & you can be of genuine help? kausalya amazing advice. It is something that i am focusing on these days. Great timing. Honestly )))), and sadly this part "changing your own mind and behaviour so that this acceptance doesn't cause you yourself to suffer" .... i know how it should work, happiness in others achievements and compassion for their sitaution when they are in pain, but it is not so easy when someone does not love you that is suppose to love you. Patience, kindness, generosity, meditation and wisdom should help me. Are there other things? ....what is it to be loved? Feeling not alone, feeling kind attention from other, feeling pleasurable physical contact. So that is where "gone" comes in. Because when i am not "gone"when i am here, very much forging on with the futile attempts at immortal empire, i need love. Then its about me, my needs, and so on. So how can i care for you, in tge final analysis? Something has to go. Right? it is not so easy when someone does not love you that is suppose to love you. Think about that statement again... it would be nice if everyone loved you, but we're conditioned by karma. We can't say that anyone is "supposed to" love us; we can only say that we wish they did. We may also be able to say that this expectation comes from others in society, but these are also samsaric beings who are scrambling for anything to end their suffering, without comprehending the actual way to accomplish that (& that happiness/suffering originate in the mind). The four forms of generosity are Dharma (or truthful/appropriate advice), material goods, love, and fearlessness. Love is best described as the heartfelt desire for others to be happy, and a commitment to act in ways that don't harm them, but support them to find temporal/ultimate happiness originating from within themselves. You desire love, and we're taught that we "need" to receive it, but it's not true. Ultimately, we have to accept the fact that our karma is what it is, and nothing is ordained for us to receive. The best we can do is work to create the conditions for receiving that kind of support, which means offering all kinds of support to others... whatever they need from us, as long as it won't harm the basic aspects of our livelihood. What has to go is your grasping at worldly comfort/grasping at a self. That's truly the futile part, because there is no guarantee that anything will manifest in this life, and there is the guarantee that we will lose this body, along with everything we currently enjoy, at death. 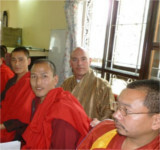 At least, try to entertain the idea of laying the groundwork for future lives of service through the Dharma. Cultivate joy at your ability to serve others, and that's all there is to it -- in this sense, it's not about us, but about all other beings. So, how this goes is, tomorrow a doctor could run some tests and tell you how many weeks you have left to live. Maybe you could accept that, but suppose it wasn't you, but the person you love most in the world getting this diagnosis. You can't imagine that a day beyond the immediate future exists. When he/she dies, essentially you to die. No time left for guru to add squat to your situation, no time for practice or enlightenment. It's done, it's over. Everything we discuss here is reliant on continuing to live, which by no means is at all certain. This is what a crown prince Sidhartha grappled with, and why he left everything behind, its not about nihilism or negativity or anything else. Its about the gap that exists in this moment, from now, until its gone. Its profound to fully understand that this entire world is filled with nothing but a dead-end of dukkha. That's exactly where you quit adding to it, to the misery of it. Its not simply "letting go" - its a confrontation with death itself and the fragility and uncertainty and relative meaninglessness of life as we know it. Very, very interesting Kausalya. I wish i knew who you were because your post has the heart level advice of a great master and yet the tone of a younger person. But how did you get to that point? Could you please say something about how you came to know all of the points that you made above? ...one more point/question to add... "we're taught that we "need" to receive it (...love...), but its not true"
"Ultimately, we have to accept the fact that our karma is what it is, and nothing is ordained for us to receive." ...the logical flaw is that both can be true. You can need something and then you do not get it. CTR I think understood that and called it sambhogakaya. The point is that both together can be a relatively stable condition. Another example, you can exist even though you will soon stop existing. Just because something will not exist forever, that is no ground to say that it does not exist (now). And just because I will die soon, is not ground to assume that I am not alive now. And just becuse Karma is a law within mental experience where my mental outlook reflects back on me, is no ground for saying I do not truly need love... ...all that stuff exists actually just as it is, even fundamental ignorance. That is the first statement in my personal experience of the Dharma: accept. H H Dalai Lama said as well, if we do not receive love in childhood, it will be hard to be caring. Still those who are not able to love, are seen as "bad ones", while they themselves are already victim, having been deprived from any needful care or kindness and are thereby empty of possibility to care themselves. For example fellows in prisons. Often there were already big problems in their childhood, by the child or due to lacking any care, any warmth. They need very much loving kindness and should not be threaten as badness because of lacking warmth. This is only risking to feed their suffering even more. But tell that someone: those who commited so much harm, need care! Pardon? Very, very difficult but still necessary. There is no inherent bad one, said H H Dalai Lama. Fortunately, now there is here and there a growing attention to learn them to be there for another, instead of being enclosed in "own bad label". They need to know the responsibility of their deed, but as well lots of care so that they find own caring abilities, which will give some ease. Children need to be loved, or it will damage them. Without being fed with kindness and care, there cannot flow any warmth from the child so easy. Blaming the child for that is risking to make it worse. "Ultimately, we have to accept the fact that our karma is what it is, and nothing is ordained for us to receive." ...the logical flaw is that both can be true. You can need something and then you do not get it. On an intellectual level, you're correct. Thank you for pointing this out. Love and affection are certainly desirable, needed for optimal functioning/development in humans and others. It is best if we do receive it. But if we don't, rather than focusing on our unfulfilled desire, we need to take it as part of the path and contemplate how we can create better conditions for others and ourselves. The present condition where we aren't being loved arose from the previous cause where we denied love to others & separated them from their companions. We can't change that reality without attaining mental flexibility to see beyond our karmic conditioning (the voice that tells us "I need to be loved and I'm not getting it"), and this flexibility comes from exchanging self with other. "All the suffering there is in this world arises from wishing our self to be happy. All the happiness there is in this world arises from wishing others to be happy." I hope this is enough to help you begin to change your focus. Thank you for the quote of Shantideva Kausalya. I cannot other than agree that to stop the feeding of 'the grasping idea' and its unfulfilled desire, is to open our heart for all. Why I posted that about children who got no loving care and will be harmed is because H H Dalai Lama gave these among few others as a reason why realizing the Buddha's meaning could be impossible ( temporary). Then even this good advice: stop now to focus on what you are and never got, open now just your very heart for all, is great but sometimes not sufficient to feed a seed. What when the water is not penetrating? Tong Len, meditation on Compassion..excluding no anyone. Fine for us. Again the example of the prisoners. Some of them are proud of the harm they did, even telling they enjoyed it. How would you help to arose at least some little affection? Since not being able to love, care, isn't that very much suffering? And all have Buddha Nature, no anyone deserve to suffer. Giving examples and giving affection sounds the easiest, but can be as well not effective, regarding H H, it can be used to take disadvantage. Accept, what is not possible right now, to not create expectations? Just so? Just open the very heart, and no acceptation must be added since all is embraced? All is fine? I have to reiterate, it is best if children do receive love, because this will reduce their obstacles in later life, and because children may be especially liable to suffering from not being able to make sense of why they're going through something, why their parent doesn't love them, etc. When we grow into adults, though, or even teenagers (really, as soon as possible), it's desirable to work through these things by developing a way to come to peace with them, at least through the use of our reasoning abilities, at first. We have to suffer a certain amount before we decide to look for a better way to conduct our lives. That's why a human rebirth is considered optimal: there's a chance of obtaining enough comfort that we can devote ourselves to practice, but the suffering we experience is enough to actually motivate us to practice. Practices like tonglen are hard for everyone to do, not just for people who lacked loving childhoods. Still, we all have to start somewhere, and I would encourage anyone to just start, regardless of how good they are. Any effort counts. Other teachings show us how to protect ourselves from "stupid compassion," where people have an opportunity to take advantage of us before we're skillful enough to stop the harm. Those who are proud of the suffering they cause simply have to suffer more before they get sick of it. No one can convince them better than their own experience with the misery of samsara. Compassion will arise for everyone at some point... it's simply a matter of time. It's not our job to convince them if they aren't ready, but we can show compassion toward them ourselves if we are ready. I'm not suggesting that people should attempt to open themselves all at once, but rather that we should try our best and do what we can according to our circumstances. The best thing we can do is to be an example to others who may not practice dharma, who do various things to hurt us or bother us, etc... this doesn't mean we have to remain close to them so that these unwelcome things can continue, but we should appreciate them for offering themselves as the object of our practice, because they teach us better than anyone about the state of our mind. I agree wholeheartedly with this. Through practice, we transform the "relative meaninglessness" of life in samsara into the fuel for our collective liberation. So my wife acts like i did at 13, doesn't want to sit for dinner, doesn't want any family traditions, says regime is like prison. Clear, let her do whatever she wants, she wants to find herself, be herself, massage vacation, ok.
Btw she has very serious manic depression and sees a therapist which helps a lot. Had a hard childhood, very aggressive and negative father. She is very aggressive and negative towards me. But she is very loving and kind to our daughter. She does not trust men, wants to be independent, get divorced but her lack of self confidence cripples her. So its very clear to me how to help my wife: support her, encourage her findng a job, finding herself, feeling successful and so on. But then there is my 5 year old daugjter. She needs peace love fun stability. Many of my favorite memories from childhood are family traditions: making dinner together, family outings, vacations, holidays at home, etc... so it can actually be quite complicated to do what is best for my wife and what is best for my daughter in a given situation. In a nutshell, my wife is like an adolescent that needs stable lovimg parents to rebel against. And my daughter needs a mom and dad who provide a stable loving family. So i am ready to cut my loses, but be patient, do what i can to help my wife start working, then accept either divorce or some turn around based on newly found self confidence. And always for my daughter provide peace, warmth, family traditions, stabity and so on. That is actually a stable working solution. I just wanted to open the discussion around the complexities of supporting the happiness of other beings simultaneously when people have conflicting immediate needs. Not personal—there is no person. Just an emanation of clear-light mind showing you what it's like to be enlightened and giving you the opportunity to manifest that same activity through mindfulness encompassing your body/speech/mind/phenomena. Every emanation is like this, whether it's living or not (human, alien, tree, rock, umbrella...), and the purpose of thinking this way is to let nothing arising to our awareness distract us from our ultimate goal of developing the mind of enlightenment. You can't necessarily help her on your own, of course. May want to consider employing a professional mediator/couple's therapist to work things through. Your motivation is there, and I believe you would be successful if you were able to start this. No need to bear the load yourself if you run the risk of subtle resentment. Better to let love guide you and assess all the options for taking pressure off both of you. The questions of what you will do, what the results will be, etc., are all in the future, which doesn't & will never exist except based on your present actions in this very moment. Please ask yourself what you can do in this moment, every moment, to manifest enlightened activity in your life for the benefit of all beings you contact now & forever. If you have a yidam, generate yourself and all phenomena as the deity and give rise to the most virtuous mind you can, free of self-cherishing, embodied in rainbow light; when this is fresh in your mind, allow yourself to feel as though, since you've received whatever dharma teachings are important to your life, you can & must practice them starting now (& for the rest of your life). You won't gain anything that helps you fix it in the future, and if you want to have the means to fix it, you will create the conditions for that to manifest by purifying your intention and using that wisdom mind to approach your problems. Making it more elaborate than that isn't necessary. Just think, "what can I do at this very moment that serves my wife and child?" Hold the goal in mind as you examine the present moment with your whole heart, and let this thought restrain you from counterproductive action. Great advice Kausalya. Thank you. It is very sensitive and attuned.